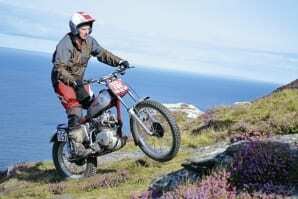 One of the most popular events on the trials calendar is the Manx International Classic Trial. A two-day affair, held latterly on September 5-6, it took riders all round the Isle of Man and provided a variety of terrain to test the skills of all entrants. Rob Bowyer, former winner of the Pre-65 Scottish, concentrates hard at Sloc Corner. There was a slight hiccup to the route on the first day when a traffic incident, unconnected with the trial, caused a road closure and needed a hasty bit of re-routing by the organisers. None of this affected James Harland, who could almost be classed as a local with parents being Manx residents, the North Eastern based lad kept his boots firmly on the pegs all weekend and not only won the trial, but added his name to the small list of riders who have won by going clean. WORLD’S BIGGEST CLASSIC MOTORCYCLE SHOW TO CELEBRATE 100 YEARS OF TT RACING!